The course is set in the bottom of a valley that faces the famous Jade Dragon Snow Mountain that is 5596 meters (18,360 ft.) high. You can enjoy mountain views from almost every place on the course. The course is situated at 3100 meters (10,800 ft.) above see level, the second highest in the world and the highest in Asia. It is 8548 yards long, which is longest par 72 in the world. Thanks to the elevation of 3000 meters (10,000 ft.) the ball flies some 15%-20% farther than normal. The three of the four par 3s measure more than 260 yards and the shortest one is 236 yards long! The shortest par 4 is, whew, as much as 436 long. And the 5th par 5 plays to 711 yards, which is the longest par 5 in the world. The front 9 has Scottish style and the back 9 is a mountainous course, and two of them have completely different characteristics. An ‘”S” shaped neat par 5. The tee-shot is downhill and water come into play for the second shot. The landing area of the second shot is narrow and there is water in front of the green. The shortest par 3 in the course. It plays slightly downhill with a wide, but not deep, green. The front and back of the green are guarded by bunkers. There was a pond on the left of the green and when the pin position is on the left, the pond will come into play. A dogleg to the left, a slightly uphill par 4. The pretty white bunkers are strategically and beautifully placed on this hole, too. The green slopes from the back to the front and has decent undulations. A downhill par 3. The green is long in width and the bunkers in front of the green are in play. A dynamic downhill par 4. The tee is the highest on the course, 3100 meters (10,170 ft.). There are trees at the back of the green and hitting over the green should be avoided, so the club selection for the approach shot is crucial here. A s harply uphill par 5. The third shot needs to fly not only over a valley but also over high trees in front of the green, so a high ball is required. 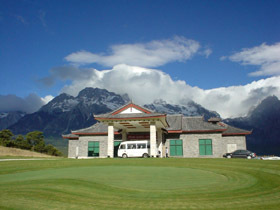 It takes one hour by air from Kuming to Lijiang and another one hour by car from the Lijiang Airport. Sited at an altitude of 3000 meters (10,000 ft.), the air is very thin, so oxygen masks are provided in the golf carts. This golf course, 3100 meters (10,170 ft.), is the second highest in the world. The highest in the world is La Paz GC, Bolivia at the dizzying height of 3300 meters (10,800 ft.). The third to the fifth golf courses are all in Colorado, U.S.A. that are around 2900 meters (9,500 ft.). A golf course of the height of 4700 meters (14.335 ft.) in Peru used to be the No.1 in the world but due to its nose-bleeding altitude, it has now been abandoned. The caddies are from a leading local minority, Naxi, who have lived in Lijiang for generations and they all wear local folk costumes. The 13 peaks of snow-covered and fog-enlaced mountain resemble a jade dragon lying in the clouds, hence, the name Jade Dragon Snow Mountain. One of my acquaintances who played this course in March said that they teed off in a little power snow and then the sun came in daytime, which got him slightly sweaty even in a short-sleeved shirt. He was able to experience 4 seasons during the play. When I played, of course there was no snow because it was May. But the temperature differed greatly from sunshine to shade. Lijiang is considered to be a pearl on the high plateau of Northwestern Yunnan Province, and is regarded as the world of “Shangri-La” (in Tibetan: a wonderful place like paradise) which people yearn to visit. Owing to its special characteristics of ethnic Culture, urban layout and historical authenticity, Lijiang Ancient City was listed as a World Cultural Heritage City by UNESCO in 1997. The Robin Nelson & Neil Haworth designed courses in Asia are Sheshan International (佘山国际) GC, Sun Island International (上海太陽島國際) GC, Qingdao Huashan International (青島華山國際) CC, Guangzhou International (広州仙村國際) GC, Century Seaview (世紀海景)CC, Xili (西麗) G&CC, Shenzhen (深圳)GC and Huizhou Tangquan (恵州溫泉) GC in China, Kai Sai Chau GC (East) in Hong Kong, Kuala Lumpur G&CC and Shan Shui G&CC in Malaysia, and Bali G&CC in Indonesia.